T-Flex™ Coin Dispenser (Canada Pennieless)Simple to install and easy to train employees, customers have told us that implementing the T-Flex Coin Dispenser can save 5 to 8 seconds on every cash transaction. This means you’ll process more customers through the line faster, which leads to increased profits. Because the T-Flex Coin Dispenser automatically calculates the correct change based on commands from the Point of Sale system, cashier errors are a thing of the past.T-Flex Benefits- Dramatically improves speed of service and customer throughputDispenses change in under 2 secondsSaves 5 to 8 seconds per cash transactionServe more customers fasterImproves speed of service by up to 15%- Safeguards against shrinkImproves accuracyReduces shortages - Increases cashier productivityEliminates bottlenecks waiting for change- Improves operational efficiencyShift changeover is much fasterLess time is spent counting coinQuicker Point of Sale reconciliation - Inherently secureCoin is secured in the canister, which is locked into the base- Less time spent training new employees - Virtually maintenance freeDimensions:368.30 x 247.65 x 165.10 (H x W x D in mm), with Canister no cupWeight:Weight 11.25 lbs (with Canister, no coin) Coin Capacity:Maximum of:$111.42 USD$506.30 CAD£254 to £361 UK (4 different canisters)€285 to €410 Euro (3 different canisters)Worldwide currencies supported (click here to view map)Dispense Speed:Dispenses coin in under 2 secondsAccuracy:99.98% accurateInterfaces Supported:RS232 serial port, USB connectivityPower Requirements:32 Volt DC, 4 amps maxPower Sonsumption 70WExternal Power Supply:100 to 240 AC, 50 or 60 Hz input, 32vDC outputCompliance:CE, UL, and CUL listed, IEC 60950-1, CB REPORT, FCC, ICES-003 & RoHS.. 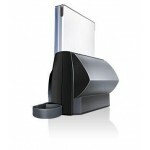 COIN SORTER / COUNTER / WRAPPER Complete solution Counting coins can be a very time-consuming and tedious task. 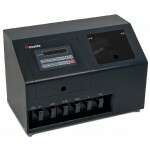 The Cassida C200 is an all-in-one solution for any coin handling need. It will count and sort all your coins at once. Coins can be sorted into designated coin bins, or can be directly put into coin rolls. Need to batch? No problem. The machine will stop exactly when you need it to. Need to see how many dimes it counted? You got it. How about the dollar amount of counted dimes? - it is there too… Whatever you need to do with your coins look no further. Cassida's C200 can do it all. Wrapping coinsIf you need to make coin rolls, just replace the coin bins with the supplied coin tubes. Coins are then sorted and counted directly into paper roll wrappers. Pressing a shortcut button once automatically sets batch quantities for all coin denominations and the C200 then automatically stops and notifies you when a particular coin roll is full. Quiet and portableThe Cassida 200 has a large, easy-to-read LED display, is quiet in operation and with a built-in steel handle ready to travel whenever you are. View brochure Technical specifications: Model: C200CAD Typical use: home, small business, retailer Counting speed: 300 coins/min Coin wrapping kit: Included Countable coins: 1¢, 5¢, 10¢, 25¢, $1, $2 Hopper capacity: 2000 coins (dimes) Coin drawer capacity: 350 coins (dimes) Reports Grand total for all coins. Coin count for each denomination. Dollar value for each denomination. Operating modes: Counting, adding and batching modes Batching type: Separate for each denomination Batching range: Preset or 0—500 Weight: 8.7 lbs Dimensions: 11.2''(w) x 10.8''(h) x 10.2''(d) Power source: 110 VAC Options: Remote display ..
Cassida C900 CAD ultra heavy duty coin counter/sorterHeavy-duty versatilityThe Cassida C900 is a heavy-duty coin counter/sorter designed for accurate and convenient counting in high-volume environments. 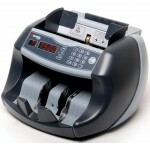 Versatile and easy to use, it delivers all of the features you would expect to find on a professional coin processor. The noise-reducing, padded coin bins and optional coin bagging attachments are all accessible from the front, minimizing operating space.Counting, adding, and batchingThe C900 includes a full suite of counting modes, plus a memory function. Batch amounts can be set as low as 1 coin or as high as 9,999. 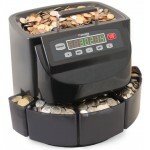 An easy-to-read LED display shows both the number of coins and dollar amount for each denomination, as well as the grand total count and value for all coins.Built to lastThe C900 is no lightweight when it comes to coin processing: its 35 pound net weight comes from its rugged steel case and precision-engineered steel components. From the ground up, it has been designed for years of high-volume operation.Easy to useThe C900 automatically sorts mixed coins into large bins. No dials and no knowledge of coin dimensions required. Just load the hopper with mixed coins, press start, and walk away. Large, easy-to-read keys provide quick access to commonly-used functions.Counts virtually any coinThe C900 can be factory set to count just about any foreign coin, including Canadian and Mexican.Options that extend versatilityThe optional coin bagging attachment allows the C900 to bulk count or batch individual denominations into their own bag in one easy step, automatically stopping when the batch is complete and letting the user know which denomination is ready. The optional printer creates hard copies of reports for your records.View brochureTechnical specifications:Model:C900 Compare with othersTypical use:Large business, bankingOperating ModesCount:Simple count; auto-stop, with memory functionBatch:Programmable batch sizes from 1-9999 ; auto-stopAdd:Totals all counts; auto-stop; memory functionReports:Grand total of all coinsSubtotal value for each denominationSubtotal count for each denominationCounting SpecsCounting speed:600 coins per minuteHopper capacity:Up to 1800 coins (dimes)Countable coin thickness:≤ 0.157" (4mm)Countable coin diameter:0.55" - 1.22" (14mm - 31mm)Product SpecsSize:18.9"w x 11"d x 12.5"h(480mm x 280mm x 318mm)Weight:34 lbs (15.4 kg)Power Input:120 ±10% VAC 60HzPower Consumption:30WWarranty:1 year full parts and labor warranty ..
Cassida 6600 UV CAD currency counter with ValuCount™VideoA feature-packed high speed currency counterThe Cassida 6600 is a professional currency counter designed to tackle a wide variety of counting jobs. Fast, accurate, and equipped with a host of smart features, it is a reliable all-around performer.Value calculation and moreValuCountTM uses the denomination selected by the user to calculate the dollar value of the count. By activating ValuCount in the add mode, users can count different denominations while keeping track of the total value. Of course, the Cassida 6600 also offers add, count, batch, and add + batch modes, making it the perfect choice when all-around performance is a requirement. View the ValuCount™ videoHalf, double and chain note detectionInfrared sensors are able to spot a wide range of bill discrepancies, including half, double, and chain notes. In all cases, the 6600 will stop the count, alert the user with beep, and display the error type on its screen.Counterfeit detectionUltraviolet (UV and UV/MG models), and magnetic sensors (UV/MG model) are able to detect a wide range of counterfeit bills. Once a counterfeit is detected, the 6600 stops the count and dispenses the suspect bill into its stacker for removal. Pressing the start button continues the count and automatically deducts the counterfeit from the overall total.Designed with the user in mindAn intelligent bill density recognition system eliminates time-consuming stops common in conventional bill counters. An innovatively engineered mechanism combines the smooth counting of a back-loading machine with the convenient hopper of a front loader. A built-in handle makes transporting the unit easy.View brochureTechnical specifications:Model range:Cassida 6600 UVCassida 6600 UV/MGCompare with othersTypical use:midsized business, retailers, vendors, municipalitiesCounting speed:1400 bills/minHopper capacity:400 new billsStacker capacity:300 new billsLoading type:Top loaderAbout loading typesDisplay type:LEDError detection:Double, half, chain and note size detectionAuto-start feature:IncludedOperating modes:Count, add, batch, add+batchValuCountTM:Calculates the dollar value of countBatching range:Preset or 1—999Error alert:Audio and visual alert systemOptions:Remote displayWeight:11 lbsDimensions:11'' x 10.5'' x 8.1''Power source:100-240 VAC..